Powerful protection when you need it most! Many human research studies have indicated that Saccharomyces boulardii can be effective in preventing antibiotic-associated diarrhea. 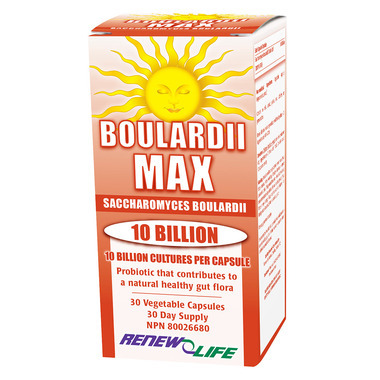 BoulardiiMAX is a supplement of Saccharomyces boulardii, a non-colonizing yeast species. It is a non-pathogenic yeast strain that is not related to the yeast group to which Candida belongs. It contains 10 billion cultures per capsule, making it one of the strongest options on the market for the treatment of anti-biotic associated diarrhea. Directions for Use: Children 6 and up/Adults: Take 1 capsule per day, approximately 2 hours after food. Do not exceed 10 capsules per day. With my many allergies, food and non-food, this is the only probiotic that I'm able to take! So glad to have an easy way ro get it! I have been using this product along with the Renew Life ULTIMATE FLORA CRITICAL CARE probiotic for about 10 months to help with IBS symptoms. Along with following a FODMAP diet, I have had remarkable improvement, and severe cramping and bloating has mostly been eliminated. Delivery is very prompt and the price is right. I buy most of my supplements from Well.ca. Was recommended to settle the gut. I was having a lot of problems and it seems to have worked. I do suffer from IBS. Very hard to find this probiotic and here it is! Same price as store in another town-with no travel. First choice in the treatment of diarrhea.